Started violin at age 3. After graduating junior high school, she moved to the U.S alone and at age 17, she entered Mannes College of Music in New York. In 2008, eRika got the Best Performance Award at Japan Classical Music competition. After graduating Mannes College, started performing as a soloist, also playing in chamber groups and several orchestras in NY. In 2010, she gave her solo debut in Romania with National Philharmonic of Romania. After 9 years in New York, she decided to move to Paris and studied at École Normal de Musique de Paris. In 2011, eRika was invited to perform again in Romania as a siloist, and also she got the Disguinshed Award at IBLA GRAND PRIZE in Italy. Fall 2011, she finished her 10 years studying in abroad. 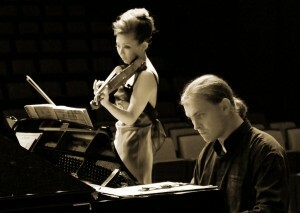 2012, she gave her first recital in her hometown, Kyoto with pianist, Ilya Kazantsev. 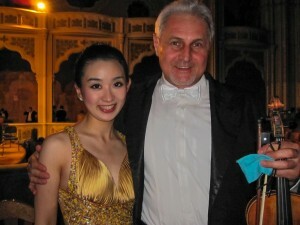 2013 her second reictal in Kyoto with the world-famous violinist/ violist, Sergey Malov. Fall 2014 eRika will have her third recital with pianist, Sehwan Park who plays in New York, Korea and all over the world. eRika and Sehwan are planning to have recitals in New York where Sehwan lives, Kyoto and Korea.